Last week YouTube announced new eligibility requirements for the Partner Program. Instead of 10,000 total views, your channel must now have at least 1,000 subscribers and 4,000 hours of watchtime over the past 12 months. But that leaves 1% of affected channels that are actually regularly earning much more than that, and they will lose out. What kinds of channels? There are appliance repair tutorial channels that people only view when they need to fix something - so people spend a lot of time watching, but few subscribe. On the flip side, there are animation channels that take months to produce a 10 minute movie - they may have many subscribers, but not many hours of viewing. And there are likely many channels that almost - but not quite - meet the new requirements. To learn more about you can get more details about the watch time on your channel, watch my brief video, or read on for more detailed information. What happens if your channel is no longer eligible for the YouTube Partner Program? 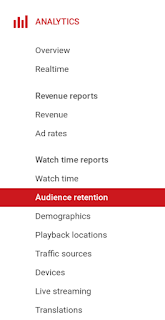 ⇨ Audience retention: Are people watching your videos to the end? ⇨ Subscriber report: when are people following - or unfollowing - your channel? If your channel is currently in the YouTube Partner Program, it will remain in the program until February 20th, 2018. At that time, if it does not meet the current eligibility requirements, it will be removed from the program. If your channel is not currently in the Partner Program, the application process has not changed. 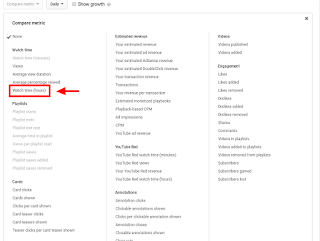 You can still set up your YouTube account and AdSense while your channel moves towards eligibility. It's probably not as bad as you think! As long as your monetization isn't disabled for cause this isn't a permanent removal from the program. 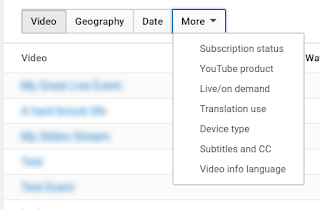 If your channel hasn't met the subscriber or watchtime requirements, but is otherwise eligible, you will see a progress bar on your channel's Monetization Settings page (www.youtube.com/account_monetization). The only features that are Partner-only are earning money by running ads, Super Chat or Sponsorships, and - unfortunately - direct email support. When YPP eligibility requirements are updated on February 20, 2018, channels that currently have access to these features will continue to have access even if they're no longer in YPP. We'll be building out new eligibility criteria for this external linking feature. Get more information in our YPP FAQs. 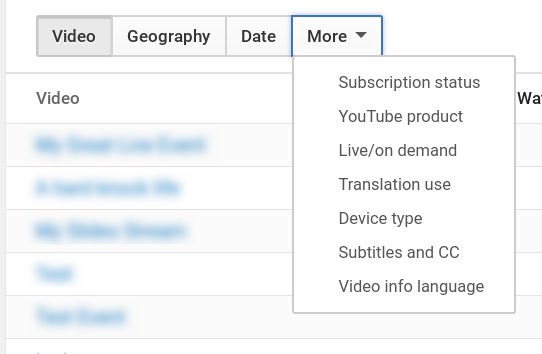 You can check which features your channel is currently eligible for on your channel's Status and Features page (www.youtube.com/features). This channel won't be eligible for the YPP any time soon. 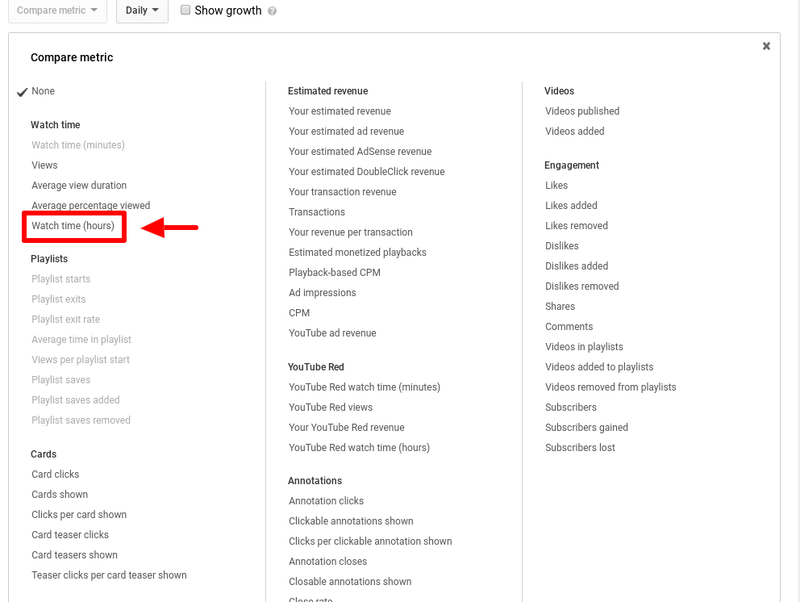 If your channel has not met the eligibility requirements, the Monetization Settings page will show how many how close your channel is to meeting them. But that overview doesn't tell the whole story. And if your channel is currently eligible, it doesn't show you how close your channel may be to dropping below the eligibility requirements. Is my channel's watch time increasing or decreasing? Does my channel have enough watch time each month to maintain eligibility in the long term? Are there specific videos with much more - or much less - watch time? Is there a specific point in my videos where viewers stop watching or lose interest? Are there specific videos that are causing my channel to gain - or lose - subscribers? Are my viewers coming from a specific website or geographic location? 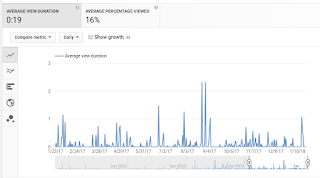 One thing you'll notice is that YouTube Analytics has a huge amount of data, so it can be hard to know where to start. 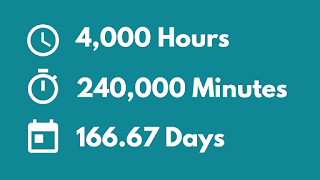 To be eligible for the YouTube Partner Program, your channel must have at least 4,000 hours (or 240,000 minutes) of watch time in the past 12 months. YouTube Analytics defaults to showing your channel's watch time in minutes over the past few months. 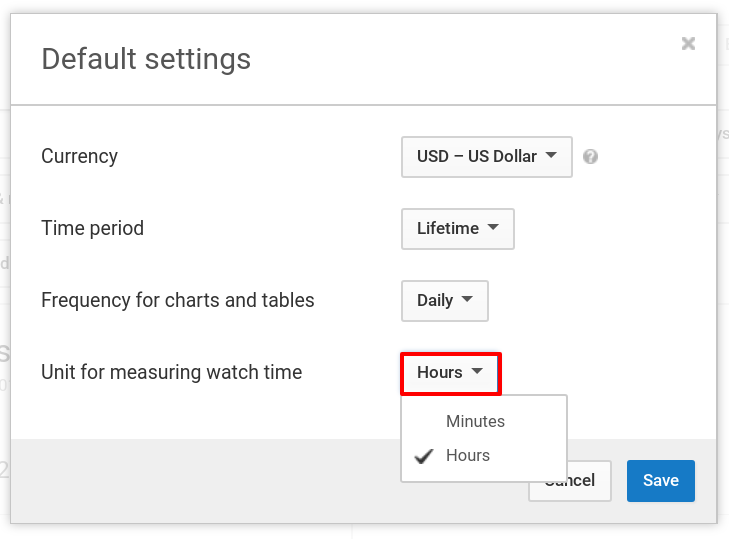 You can use a bit of math to turn minutes into hours, or you can change the YouTube Analytics settings. The watch time requirement is over the past 12 months, which is one year or 365 days (if it's not a leap year). The default time period can also be set. 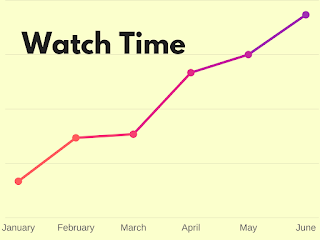 That will show you an overview of your channel, including hours of watch time, in the past year. 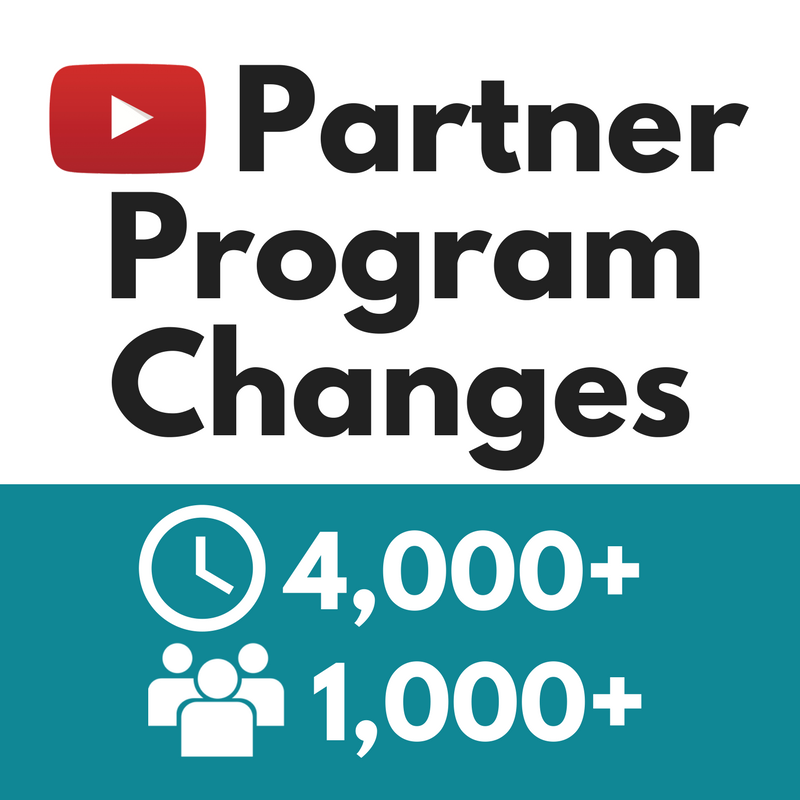 Keep in mind that your channel must maintain that level of watch time to remain in the Partner Program. 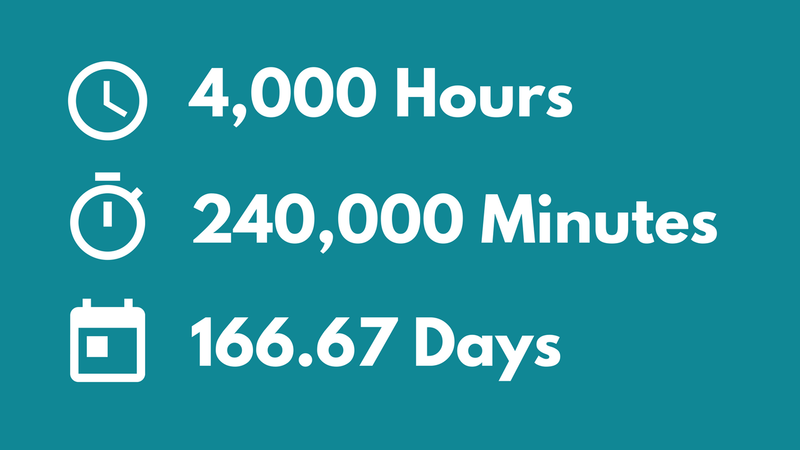 4,000 hours of watch time per year, is equivalent to 20,000 minutes of watch time per month. 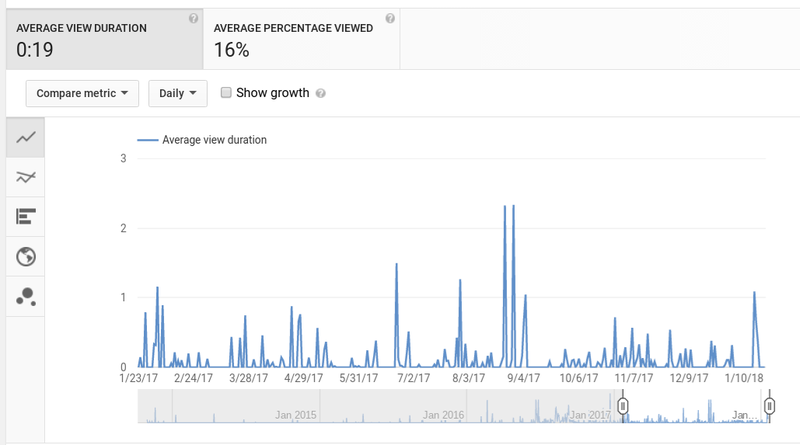 Your channel's Overview won't show you how your channel is performing over time or which videos are performing well or poorly. 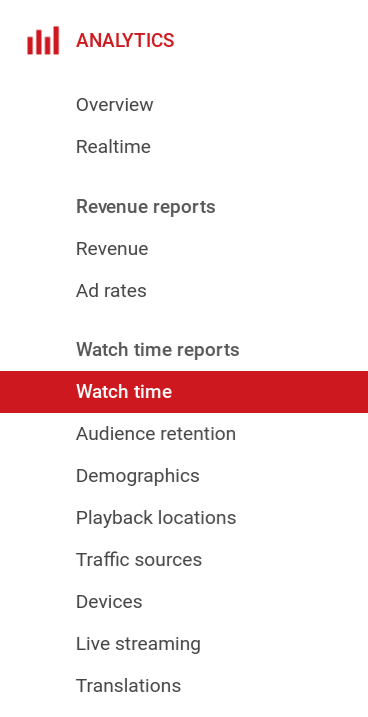 I think the watch time reports are easiest to understand when viewing minutes (at least for my channel that isn't getting hundreds of hours of watch time a day). But it's nice to be able to view both hours and minutes in the same report. 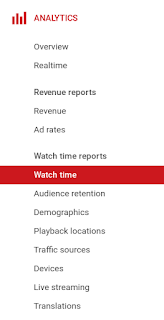 That adds Watch time (hours) as a metric to your report overview, and individual video statistics. You can easily return to your favorite report by bookmarking the page after configuring the settings. 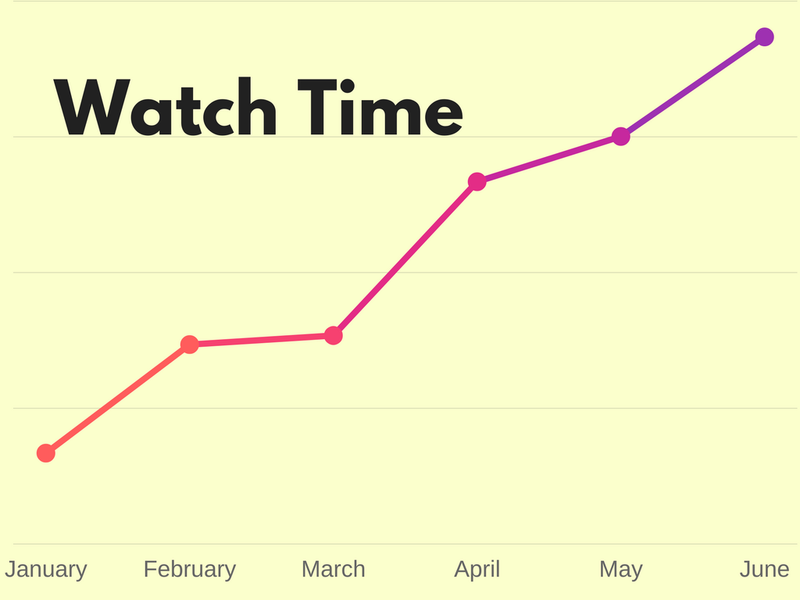 The Watch time report shows a graph of watch time over the time period selected. You can easily see how your watch time has changed over that period. Immediately below the graph you will see your videos listed from most to least watch time. That will give you a good idea of what content of yours is performing well, and what might need some tweaking. Click on a video title or other metric to get more details. There are several components that determine how much time people spend watching your videos: how many people watch, how many videos they watch, and how long they watch each video. That last element - how long people watch each video - can make a big difference. Hour-long videos won't generate much watch time if each viewer only watches for one minute before clicking away. 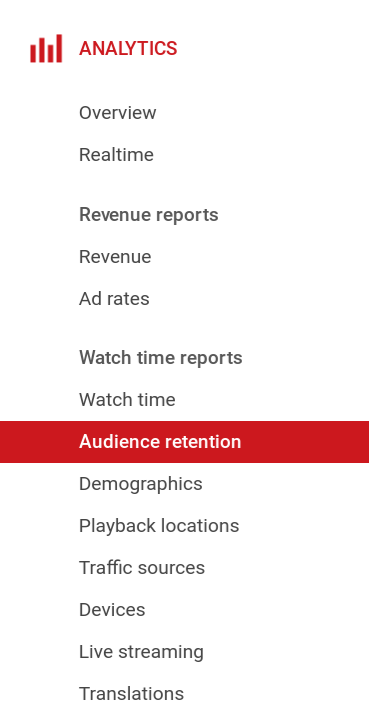 The Audience retention report lets you see how long viewers are sticking with each video. 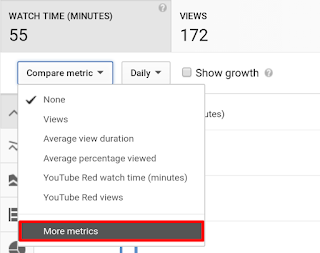 The report gives you an overview of average view duration and average percentage viewed. 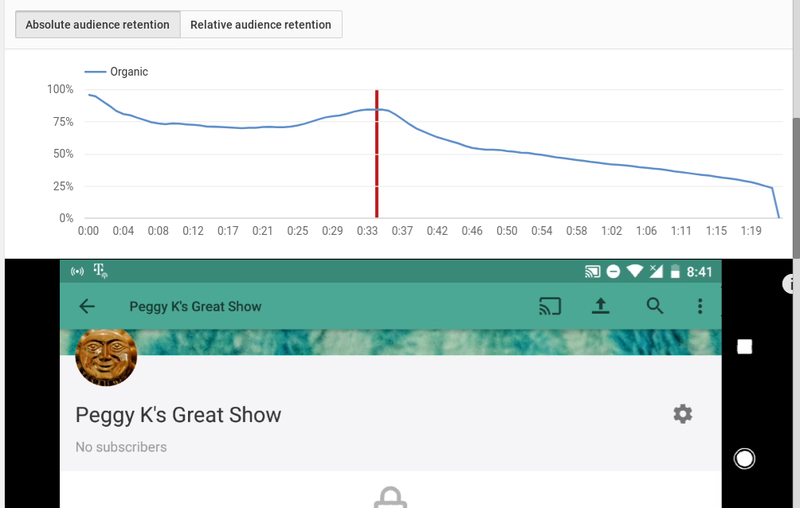 Below the graph showing audience retention over time, click an individual video title to see a detailed report. 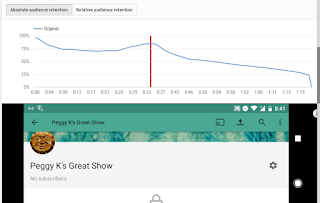 The individual video report shows audience retention over time matched to a preview of the video itself, so you can see at what exact point the audience leaves or points where viewers re-watched the content. ⇨ Subscribers report: when are people following - and unfollowing - your channel? Subscriber metrics were improved Sept. 2017 - before that "Other"
You can also get a detailed overview of your subscribers by viewing the Subscribers Report. 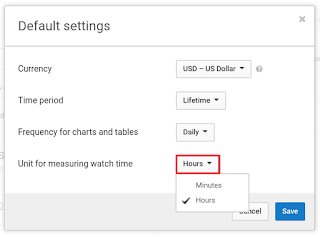 There are a number of steps you can take to try to improve the watch time on your channel. Obviously increasing your channel's overall viewership can make a positive difference. The YouTube Creator Academy has a series of free courses that can help you Grow your channel. Create an official series playlist of your related videos. That "allows other videos in the playlist to be featured and recommended when someone is viewing a video in the series playlist". Use Cards to point viewers to your other videos or playlists. Place the Card just before the average viewer stops watching. Add an End Screen to your videos to encourage viewers to subscribe and watch your other videos. And keep in mind that even if your channel is no longer eligible for monetization, you can still earn money through crowdfunding or selling merch. I think this change is Good and Bad too. I accept the Watch time is good condition here, but why 1000 Subscriber ? All channels are not interesting/funny that entertain people so they can Subscribe. Some channels are Technical, Repairing, Software troubleshooting. Once the viewers watch the video and solved their problem related to their issue- they gone, they don't subscribe because they don't have other problems with their PC. So they don't watch other videos on that channel nor Subscribe because they don't have others problem which discuss in other videos. I don't understand WHY YouTube make 1000 Subscribers rules for monetization? Watch time... OK ... I accept it is GOOD change in monetization process. HOPE they will change this SUBSCRIBER criteria Soon, so my channel will start earning again after February 20, 2018.